You are here: Home / Sides & Salads / A Perfect Holiday Stuffing – Gluten Free!! 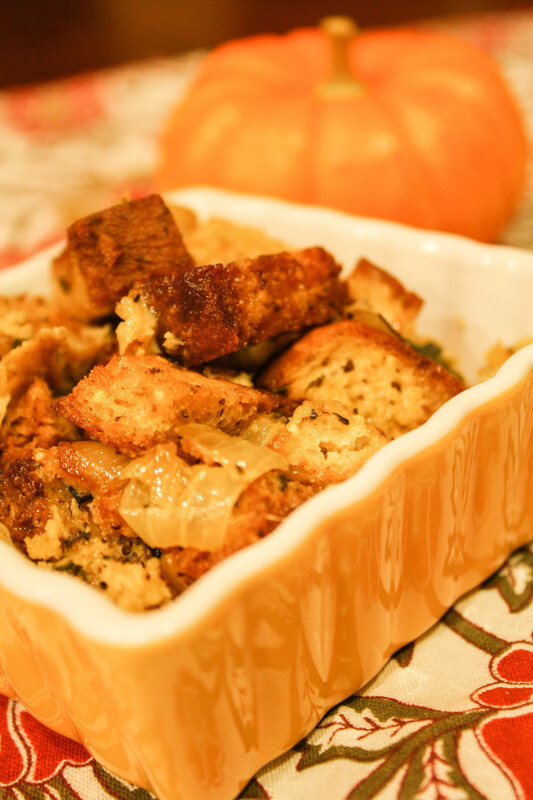 A Perfect Holiday Stuffing – Gluten Free!! I finally nailed it! It took three very different attempts…but I have finally perfected a basic stuffing to put on the Thanksgiving table (this is for YOU sister dear!)! Let me first share that I am not a huge connoisseur of stuffing…it was always Stove Top growing up…and, well…I just didn’t get too excited about it. I never realized fresh stuffing tastes SO much better! I had found a recipe from the 1950’s that had kale, Italian sausage, and Parmesan…it was really a knock-out stuffing. But to recreate a gluten-free version…I wanted to keep it simple to start and then add in fun goodies later. So if you like sweet-tart varieties, I am sure this could be adapted to have diced tart apples or cranberries. If you like meaty versions, ground -up sausage would be good. If cheesy fits your bill (and your body’s!) then add some Parmesan or Pecorino Romano. For today, be happy with this crowd-pleasing version and look forward to all the creative things you can do if that is what you wish. What way do you like YOUR stuffing? INGREDIENT NOTE: I chose to use weight for the bread as every gluten free bread weighs differently. Some people have homemade bread, and I figured this was the best way to get the most consistent results. I have many gluten free and paleo holiday recipe you could peruse. 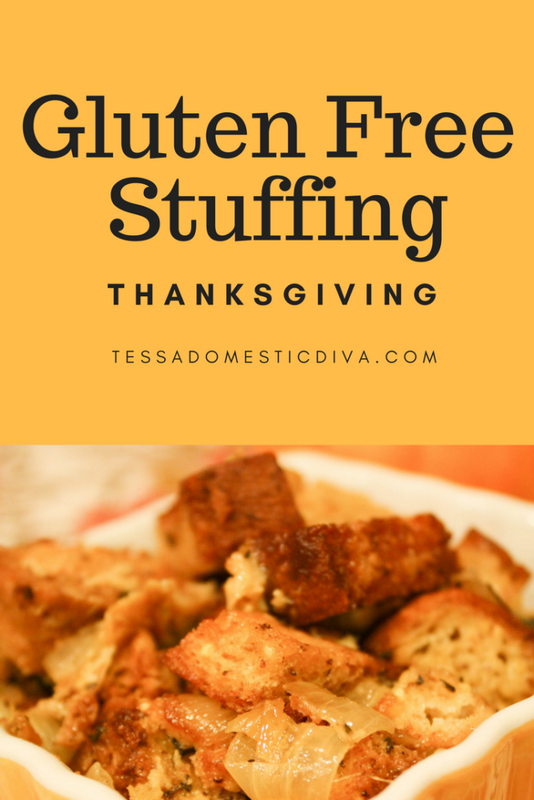 A Perfect Holiday Stuffing - Gluten Free!! 1 teaspoon sage I used fresh, but dry would work too! 2 cups gluten free chicken brothor veggie broth Use a homemade or high quality one with lots flavor for best results. Bake for 12-17 minutes until the cubes are dried and crispy (much like a crouton). While the cubes are toasting, heat the avocado oil over medium heat. Saute the onion and celery for 8-10 minutes until soft. Add in the spices and stir to warm and mix them. Toss in the chicken broth and eggs and mix well. Put the mixture into a greased 3 quart baking dish. Cover and bake for about 30 minutes. Remove the lid (or foil) and let it get crispy in the oven for another 10 minutes. I have chosen your recipe as one of my features for this weeks Real Food Fridays Blog Hop that goes live tomorrow @ 7pm EST. Thanks for being part of Real Food Fridays blog hop. That IS a tough order Gigi…lots of paleo recipes out there, you would just have to leave the nuts out..! This sounds great! Thanks Tessa! We decided to go with a caramelized onion, sausage, sweet potato stuffing that was tasty. No one missed the bread stuffing at all! Thanks for sharing on Natural Living Monday! I always love your recipes. I am excited to see what you have to share this week! This sounds amazing Tess! Thanks for sharing with Simple Meals Friday! I hope you will join us again this weekend! Hey tissa.. a lovely recipe, i didn’t try it before but i will go for it now.. really good..
Fabulous timing my dear! Featuring this stuffing this week on AFW 🙂 And maybe I will actually get to make this to go with Christmas dinner next month when life settles down. I am still debating if I want to try dressing this year. I am getting up my courage 🙂 LOL Got this tweeted and pinned! Stove Top stuffing is my guilty pleasure, but I make a delicious celery and apricot stuffing as well as a good sausage stuffing. 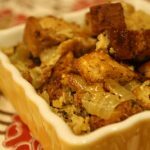 Your Gluten Free Holiday stuffing sounds fantastic with the lovely herbs and flavours you have used. I like how simple it is and yet how delicious it sounds! Thanks for submitting this to My Meatless Mondays. It is my pleasure to feature it. I love stuffing and this looks like one that belongs on the top of the list. Thanks for helping me get ready for my first gluten-free Thanksgiving! I’ve seen a lot of recipes, but I think I’m going to pick yours! 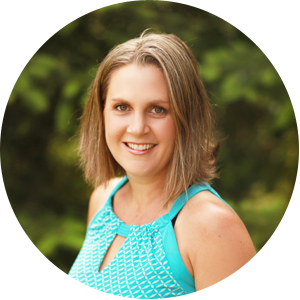 Thanks for linking up on Gluten-Free Monday at OneCreativeMommy.com. Thanks so much for linking up to "Simple Meals Friday". Hope to see you again next week! We just make corn bread and crumble it up. Add the onion, celery, egg, broth, salt, pepper, and sage. Corn bread is GF. This is southern style stuffing. You did a great job. That stuffing looks delicious. Thanks for sharing it at Gluten-Free Wednesdays. @ Michelle…I was going to work on a french bread recipe this week too! We'll have to compare! Tessa, I think about a dish, then find out you've already mastered it. Thanks for taking all the leg-work out of it for me 🙂 This looks fantastic! I am trying my hand at a gluten-free french bread recipe this week. (I have my doubts, the recipe just looks too simple.) If it works, I could use it for stuffing. However, my husband has never been a big stuffing eater, so I'm not going to all the work (he's the only one w/ a wheat allergy) if he doesn't want it. Thanks for sharing this Thanksgiving favorite! I'll let you know how the french bread turns out. Hi! Just wanted to let you know I included this dish in my post, An Allergy Friendly Thanksgiving Menu — linked back to you and everything 🙂 Have a great holiday! What a fabulous recipe! I must try this for thanksgiving, thank you so much! I love the simplicity of this recipe. It's difficult to get the base just right. This is great. Thanks Tessa.